Gray Falcon: Ahtisaari's Real "Rubbish"
Following a report in the Bosnian magazine Fokus, Serbian officials have requested an investigation into allegations that UN envoy Martti Ahtisaari had taken bribes from the Albanian mafia. According to the magazine, surveillance carried out by the German intelligence (BND) produced evidence of Ahtisaari accepting cash and bank transfer payments from Albanian mafia figures. The former president of Finland was appointed in 2005 to oversee negotiations between Serbian authorities and the provisional Albanian government set up by the UN in the occupied province, following the 1999 NATO invasion. In February this year, he unveiled his "proposal" for the province that would see it detached from Serbia but functioning as an EU protectorate. Ahtisaari's spokesman, Remi Dourlot, dismissed the magazine's allegations: "This is a rubbish story, which is actually from a Republica Srpska magazine." Fokus is indeed published in the Bosnian Serb Republic (RS), but what is Dourlot's point, exactly? That allegations are preposterous simply because they come from a Serb magazine? Dourlot's dismissal of the story isn't news in itself. But the reasoning he gave - or lack thereof - may just be another important piece towards completing the Ahtisaari puzzle. There is plenty of speculation about Ahtisaari's past and his motives in being at the forefront of carving up Serbia, but it is futile to argue he is not hostile to Serbs. "If the EU cannot do this, it can forget about its role in international affairs. If we can't do this during the German presidency, we should give up and admit we can't do anything." One can understand the desire to have the EU assert itself diplomatically - however misguided - but what do the Germans have to do with it? Could Ahtisaari's vision of European unity be closer to Quisling's than DeGaulle's? But then there is the issue of cold, hard cash. The Fokus story named names, listed numbers of bank accounts. In this day and age, it is entirely too easy to verify a story and prove it right or wrong - provided that people want to hear the truth in the first place. 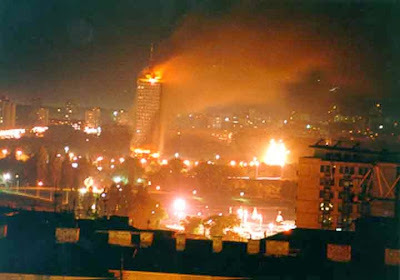 Given that the Empire's case for Kosovo independence is built on violence and lies and that everything concerning the Albanian organized crime is swept under the rug, Dourlot's dismissal of the Fokus story as "rubbish from a Serb magazine" calls forth a phrase well-known to political reporters: "Believe nothing until it's been officially denied." I've read several different articles recently in regards to Germany's involvment in the carving up of Yugoslavia and have noticed that this approach they are taking is not much different than what Hitler tried to do which ended up with WWII. The same countries that fought to stop Hitler back then are now embracing Germany and what they are doing. During WWII they killed over 6 million Jews, now they've killed thousands of innocent Serbs with the help of the U.S. and contaminated the soil so they can't grow fruits and vegetables without worrying about the poisonous chemicals that were dropped on them during the bombing. I think Europe needs to think very hard about the outcome of their actions and who is going to benefit the most. It's no secret that Germany, Austria, Belgium, etc. have always hated the Serbs and will stop at nothing to eventually eliminate them from planet, just like they tried to do to the Jews. All the Serbian people I know are warm, friendly and generous people. British Prime Minister Lord Palmerston once observed that "nations have neither eternal friends nor eternal enemies, only permanent interests." The Balkans policy of the West today mirrors that of Vienna, Berlin and even London a century ago, and that's no accident. Of course, it would do the Imperial policymakers good to remember these designs all ultimately failed. I would not go so far as to say that hatred of Serbs among the people you described (who are these "Belgians," anyway?) is akin to Hitler's hatred of the Jews. But I'd be willing to wager many a Western politician over the course of the past two centuries has wished to be rid of that "pesky" nation that tends to foil their grand designs because they are stubborn and proud. The belgians are a strange lot. A few years ago I was present at the belgian 'national day' with a dutch friend of mine. There's a full military parade, flyby, army and airforce fun camps for children (simulators and aerial runways etc. etc.). My dutch friend was horrified and mystified by all the militarism and asked "Why?". It's like the short guy in the group having to 'prove' himself by being even more vicious, to the point of argubly committing genocide. "I soon discovered that it goes back to the days of the reign of King Leopold I, who not wanting beligum to be left out of the european empire stakes." Actually, it was Leopold II. Belgian Congo is the place where all the lefties' accusations of massive colonial exploitation came true, all under the ruse of "ending slavery". It was a coincidence that rubber came in high demand just at that time, due to the invention of the automobile. Leopold II became insanely rich from this, and left the dirt for Belgium to clean up behind him. Also, a significant portion of the money was set aside to create monuments and palaces in Brussels. But these are lifeless. Dirty too. In the darkness of one of the most crime-ridden capitals of Europe, it seems like these statues are hauntingly present on every second corner of the badly maintained city. And, Belgium is poised for complete dismemberment.